If you are a veteran, or if you are caring for one, it is essential to understand the many veterans’ benefits programs available through the Department of Veterans Affairs (VA). Often, financial support is available to a veterans spouse or their survivors as well as the veteran themselves. Even if there has never been a claim made for veteran benefits before, s/he may now qualify for help based the veteran’s current age, physical condition, or low income. Even if the veteran qualifies for Medicare, there can be advantages to choosing VA care for healthcare coverage. For example, Medicare does not cover physical exams and other preventative care, dental care, long-term in-home care or long-term nursing home residential care. The costs of VA co-pays and deductibles are generally lower than Medicare, and that includes prescription drugs. Some veterans can qualify for both Medicare and VA health coverage which can in some circumstances be extended to family members as well. Many financial benefits available through the VA are offered through “service-connected disabilities.” These disabilities can include physical, mental, or emotional conditions which limit or preclude a veteran from performing various everyday activities deemed normal. A veteran does not have to have become disabled while in the military to qualify for these benefits. Service-connected disabilities can begin during military service and only start to show as the veteran ages. The vital point to understand is the disabling condition was caused during or aggravated by the veteran’s military service. The condition that becomes disabling later in life can make a veteran eligible for a monthly disability compensation payment. When the VA reviews an applicant’s request for compensation, it will assign a rating to the disabling condition beginning at 10 percent or more. The rating is in 10 percent increments. The lowest rating at 10 percent in 2018 pays $117 per month while the highest rating at 100 percent pays $2,527 a month. Veterans who are housebound or require “aid and attendance” (regular in-home care) can receive an even higher monthly amount. Older veterans with a 30 percent or higher rating can have their spouse qualify for additional monthly benefits as well. The VA can also help veterans with service-connected disabilities by supplying loans or grants to modify a home, whether it is the veteran’s home or the home of a family member where the veteran lives, through the Specially Adapted Housing (SAH) grants program. Special car modifications are available through a similar program. The VA also offers several types of loans and loan guarantees to aid veterans in the purchase of or refinancing of a home, townhome, or condominium. If a veteran (65 or older) has a low income, has had 90 or more active days of military service, and at least one of those days during a period of war (World War II, Korean War, Vietnam War and the Persian Gulf War) they qualify for a VA pension even if the veteran was not in combat. 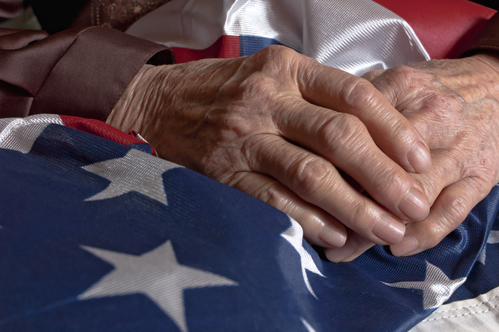 If a wartime veteran or a surviving spouse requires care on a regular basis, the amount paid can be over $2,000 per month in tax-free income. However, there are specific financial and medical requirements for this benefit. Applying for, or assisting a veteran in the application process for VA benefits can help them improve their quality of life or benefit their survivors. While there are toll-free numbers and websites to inform claimants, the procedures are complicated and can be confusing. We would be happy to talk to you about your situation and help you understand your options. We look forward to hearing from you!